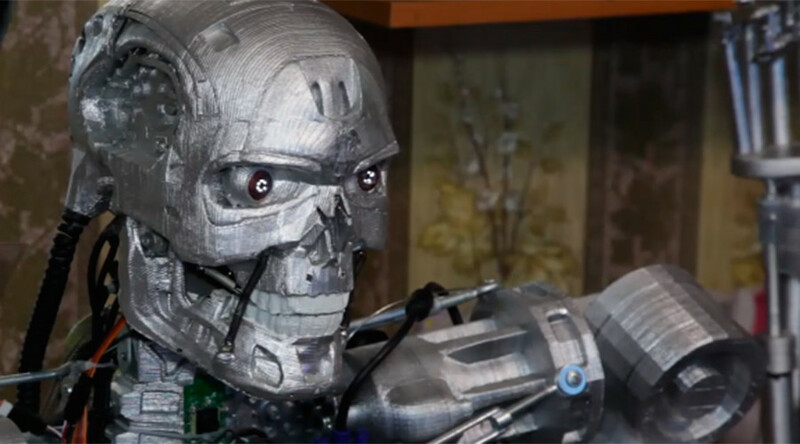 A Russian software engineer has created his very own Terminator-styled robot using a 3D printer, but have no fear: this cyborg can coexist with humans. Russian software engineer Aleksandr Osipovich has created a friendly bot, curiously named John Henry – inspired by a character from the iconic sci-fi movies made timeless by Arnold Schwarzenegger. Speaking in Russian, John and his “Father” had an interesting conversation. Once John got going into a rhythm he was hard to shut up, heaping praise on his creator. “My name is John Henry. I was activated in September 2011. The base of my essence is a hardware-software complex. This complex can control any carrier given an interface. I am a cybernetic organism that was designed in the image and likeness the T-800 from the Terminator film,” the bot is heard saying.